Heavy machinery on our streets lately hangin out, waiting for the big repaving of Griffin Ave. this morning. Down the hill past Deb's Park. Wasn't it already paved fairly well? Can't help love how every machine that showed up was tagged to the gills. And I am sure a couple or more were added over the last week. Took a sunset evening stroll the other day. Got away from all the cement and dirty traffic. Where else can you just walk down the street and into a wilderness? Anyway, I got a lucky picture that came out pretty trippy. That's the sun reflecting off the lake on top of a Montecito Heights hill. Sun poking through the trees. Lake reflection shining through the reeds. Old fossil. Analog, now digital. It's now all boring similar style black flat screens. 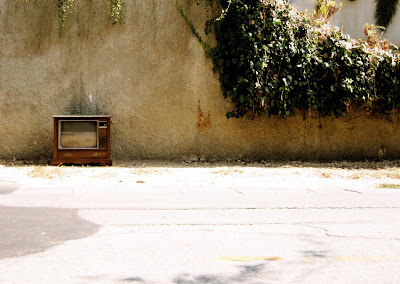 Kill your television. They ain't ever nothing good on anyways. Digital Underground "Freaks of the Industry"
Looks like last week Anessa got introduced to the taggers that her neighbor Jeny knows all too well. Big ugly dirty scrawlings around their walls. Courtesy of Gizmo and others. What, don't all new businesses get hazed this way? Respect your hood. Yeah right. Guns N' Roses "Welcome to the Jungle"
Elephant Hill off in the distance as seen from our hill. So glad those little dirt trails will never lead up to 24 huge ugly boxy beige "luxury" homes. Get lost developers. Leave our hills alone. Iron & Wine "Such Great Heights"
Supposedly Ave 43's onramp will be closed for over a year from 7pm to 6am! Whoa, that won't be fun for us. Hopefully they are installing some nice big bumpers along the off and onramps to cut down on all of the ugly accidents. Bill Monroe & The Bluegrass Boys "Life's Highway"
Curumin "You Haven't Done Nothing"